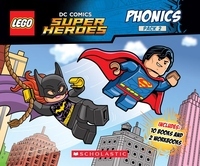 Learn to read with SUPERMAN, BATMAN, WONDER WOMAN, and all the other characters from the LEGO(R) DC Super Heroes Universe! A perfect companion to the original, this brand new set introduces new sounds like "sh," "ch," and "th." Set includes ten books and two workbooks, all held in a sturdy box with plastic handle.